The Toonami Trending Rundown for February 2-3, 2019. Mob Psycho 100’s first season’s run comes to an end as Reigen comes to bail Mob, Teru, and Ritsu out, while the Z Fighters head to the Null Realm for the Tournament of Power, and Shiapouf and Youpi desperately attempt to revive Meruem, among other great moments. On Twitter, every show from JoJo’s to Shippuden would successfully trend in the US, while on Tumblr, only My Hero Academia would trend. 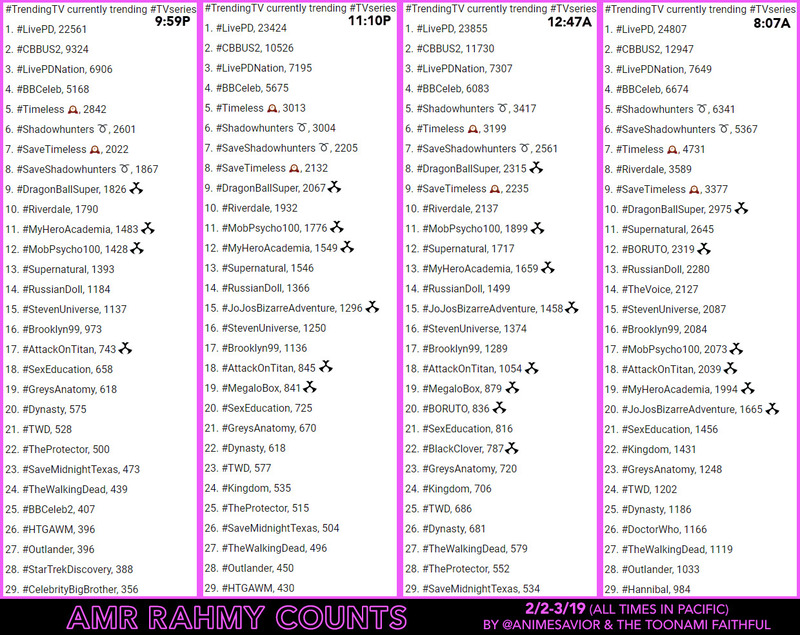 The full list including statistics and tweet counts from the twitter app and Amr Rahmy’s analytics app can be seen below. This week’s feature is the trailer for the season 3 premiere of Sword Art Online in Project Alicization. You can check it out below. On Saturday, Pony Canyon released the newest trailer for the upcoming second half of Attack on Titan Season 3. The season is set to continue in April with an airing on Toonami still to be determined. You can check it out by clicking here. Dragon Ball Super: Broly’s theatrical run may be running down, but its run didn’t come without some big milestones for the anime industry, grossing a total of over $100 Million in worldwide box office sales. What will this great franchise bring us next, we shall see. Around the time One Punch Man joined the better cartoon show and gained immense popularity inside and outside Toonami’s scope, many were also being introduced to One’s other work, Mob Psycho 100. Not surprisingly, it was among the most requested shows Jason DeMarco has received during the time, and fans had high hopes Mob would also join Toonami eventually. However, despite lobbying from Chris Niosi, the voice of Reigen and other fans as well as attempts from Toonami themselves, offers to air the show were refused by Crunchyroll for reasons unknown. Fortunately, Mob wouldn’t be denied forever, as Toonami would form a partnership with Crunchyroll partly spurred by the AT&T-Time Warner merger, and their first order of business was to bring Mob Psycho 100 to Toonami, which made its premiere on October 27, 2018. 12 weeks of Mob trying to control his powers and live an everyday normal life, and now we can now say that season 1 is in the books. During the show’s run, #MobPsycho100 trended on twitter in some capacity during 9 out of 12 weeks of its run, including in the US during its 11th episode. Stats have also been recorded from Amr Rahmy’s trending TV app during all 10 weeks since we started recording this stat. Mob Psycho 100 as well as #MP100 also trended on tumblr during its 7th episode. As we have previously mentioned, there is a second season in the works, which is presently airing in Japan and streaming on Crunchyroll and Funimation Now. While Crunchyroll have announced that they will be dubbing the new season, we haven’t heard any official word on when the dub will be coming out or if and when Toonami will be able to air it as of now, hence why Mob is going into a hiatus from Toonami for now. If we were to speculate and go by the previous season, Season 1’s dub was released on November 2016, 4 months after the Japanese premiere and a month after it concluded. If the dub release follows a similar pattern to season 1, we could possibly see a dub release around May. Of course, this all depends on if Crunchyroll does give Toonami TV broadcast premiere rights again, but we’ll see what happens. Thanks for the memories, Mob, and we hope to see you back here soon. Tune in next week as Sword Art Online makes its grand return to Toonami for Project Alicization with a special 1 hour premiere event. And just to let you know, because the premiere is an hour long, Megalo Box will be taking the night off to make way, so make sure to plan and/or set your DVRs accordingly. Until next week, have a Happy Year of the Pig and stay gold. Legend: The shows listed are ordered based on their appearance on the schedule. Show trends are listed in bold. 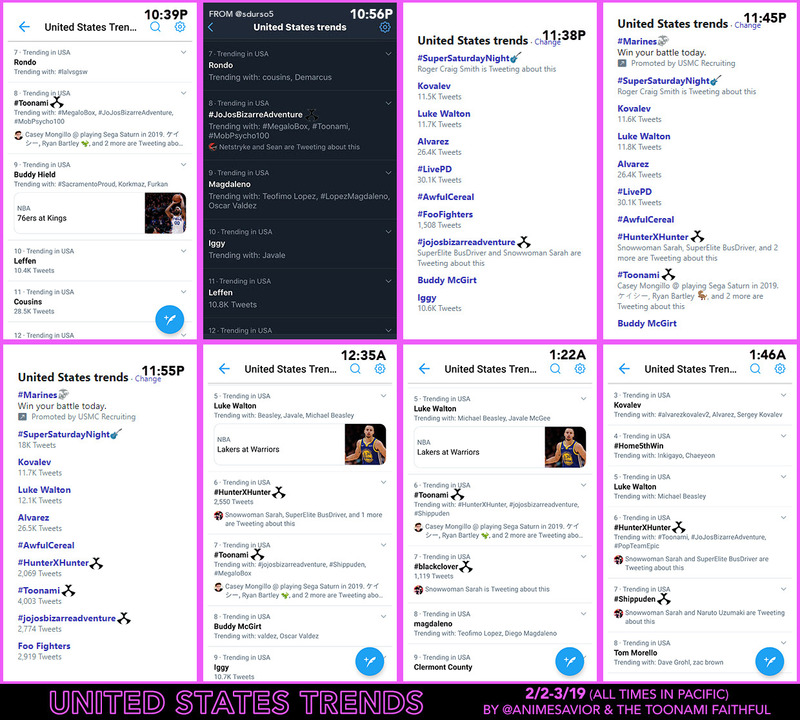 The number next to the listed trend represents the highest it trended on the list (not counting the promoted trend), judging only by the images placed in the rundown.Forthe Twitter tweet counts, the listed number of tweets are also sorely based on the highest number shown based on the images on the rundown. #Toonami: @WhoTrendedIT reported that @CaseyTheVA and @dragonballsuper started the trend in the US. #MobPsycho100: @WhoTrendedIT reported that @KyleMcCarley and @Kirbopher started the trend in the US. #MegaloBox: @WhoTrendedIT reported that @KaijiTang and @robbiedaymond started the trend in the US. Special thanks to @coreymbarnes, @sdurso5, and others I forgot to mention for spotting some of the trends on this list. System Call. Only Toonami on [adult swim] on Cartoon Network.